Do you have birthmarks, freckles or sun spots caused by UV exposure that you would like to permanently remove? With MedLite C6 sun spot removal laser treatments you can eliminate excess pigment and create the clear complexion that you desire. MedLite C6’s revolutionary technology can revitalize your skin in just a few quick and easy sessions. Using FDA-approved Q-Switched Nd: YAG technology, the MedLite C6 is able to safely penetrate the surface of the skin to eliminate excess melanin. Topical creams are only able to fade or lighten dark spots on the surface of the skin, while the MedLite C6 laser goes deep into the dermis to blast away brown spots. Laser dark spot removal fades even the darkest birthmarks without damaging the surrounding skin. Depending on their darkness and size, most dark spots require only a few short laser treatments to be completely removed. The ultra-concentrated laser works by breaking up the brown spots into tiny particles that the body can eliminate through the lymphatic system and circulation. Sun spots experience a subtle desquamation and eventually slough off, thus revealing clear and flawless skin on the face, neck, chest, hands, arms and legs. 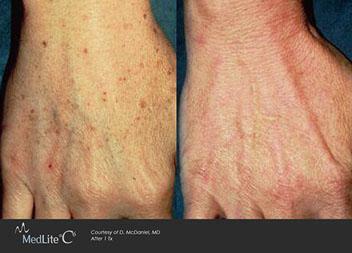 Laser sun spot removal treatment is fast, with most sessions lasting just under an hour. Depending on the darkness and size of your brown spots, several treatments may be recommended to achieve the best results. MedLite C6 dark spot removal is relatively painless, with most patients comparing laser pulses to the snap of a thin rubber band. Laser treatments have few side effects, including some redness and minor swelling. Most patients typically resume their normal activities immediately after treatment.